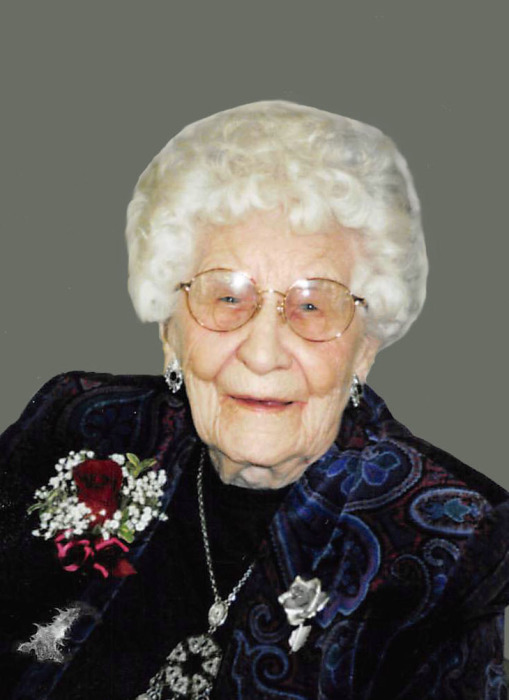 Rena Bagne, age 110, of Ortonville, died August 26, 2018, at Fairway View Neighborhoods in Ortonville, MN. Funeral services will be held on Saturday, September 1, 2018, at 11am at the Orpheum Theatre located in the Fairway View Communities building. Visitation will be held one hour prior to services on Saturday at the nursing home. Rev. David Tonn will officiate and interment will be in Mound Cemetery in Ortonville. Rena Elvena (Haldorson) Bagne was born on March, 2, 1908, in Kamsack, Saskatchewan, Canada to Hjalmer O. and Inga (Mickelson) Haldorson. The family moved to Starbuck, MN, where she attended school and graduated from Glenwood High School in 1924. Rena was baptized and confirmed at St. John’s Lutheran Church in Starbuck. After high school, she attended Bethany Lutheran Nursing School in Minneapolis and attained her LPN. Rena worked at hospitals in Minneapolis and later, at Lutheran Memorial Hospital in Chicago, IL. On March 3, 1946, she was united in marriage to Walter Bagne at the Norwegian Lutheran Memorial Church in Chicago. After living in Chicago for two years, the couple moved to Ortonville, MN, and bought Fletcher’s Variety Store. They operated the Bagne’s Gift Shop for many years, including six years after Walter had passed away. Rena retired from nursing and started to take care of the elderly people in the Ortonville area for ten years. She was an active member of First English Lutheran Church and was a member of the Day of Love quilt making group for over 30 years. She worked with the Red Cross Blood Bank and enjoyed gardening. Rena and Walter also had a cottage on Big Stone Lake where Rena enjoyed fishing. She loved to dance, loved fried chicken wings, homemade lefsa and donuts, and loved to play cards. Most of all, Rena loved helping people. Left to cherish her memory are her ten nieces and two nephews. Preceding Rena in death are her parents; husband, Walter in 1974; three sisters; and one brother.